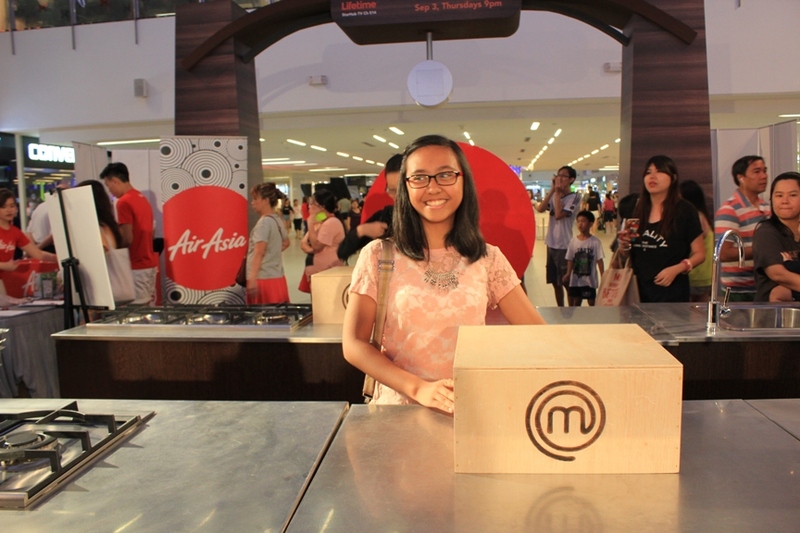 Last Saturday, I was invited to the MasterChef Asia Meet and Greet Event which was held at NEX Atrium in Serangoon. I brought along K with me as she is a MasterChef fanatic. 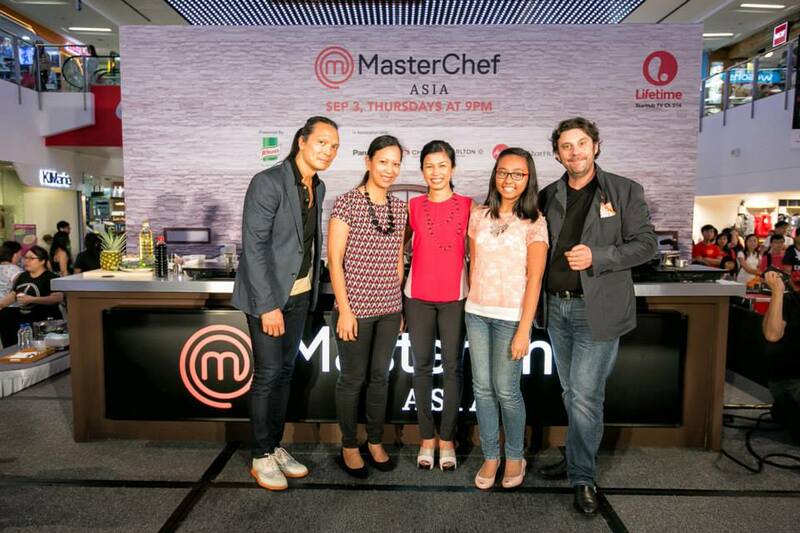 We got to meet the MasterChef Asia panel of judges (more on that later) and of course, the Singapore contenders! Sandwiched between me and K are (L-R) Sandrian, Lennard and Leong. The photo was taken after their fun cook-off. Sandrian is a homemaker of Thai-Chinese parentage. Her first memories of cooking date back to helping her mother pound spices in the kitchen. Before becoming a full-time homemaker, Sandrian worked in the semiconductor industry in Singapore for 8 years. 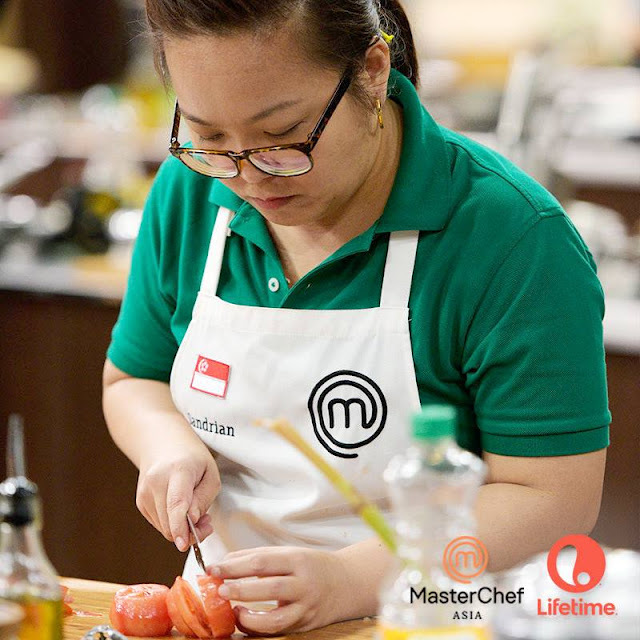 She now hopes to pursue her interest in cooking and she considers herself a strong contender in MasterChef Asia. Lennard describes himself as full-time engineer and part-time self-taught home cook. In the past 5 years, YouTube and cookbooks have helped him put together dishes with modern twists. Lennard prides himself on his keen aesthetic sensibilities and plating skills. Through MasterChef Asia, he hopes to make his passion his career and believes he has what it takes to be a professional chef. 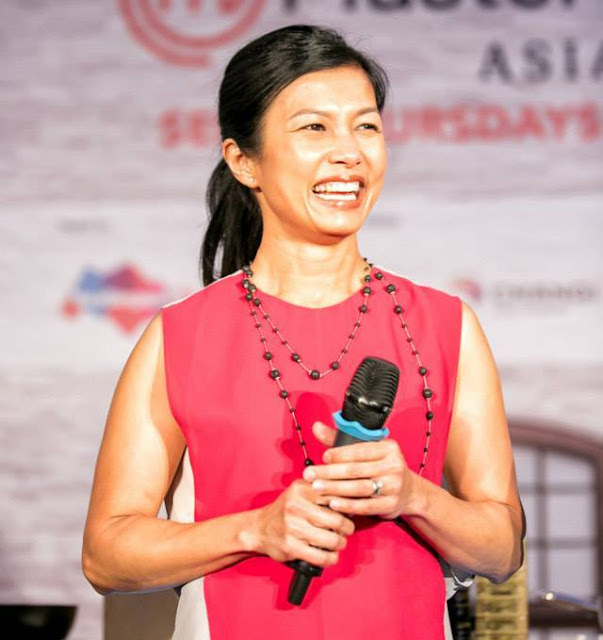 Leong is a lawyer by profession and a self-professed food geek who enjoys reading about food and experimenting with basic ingredients. He started cooking in his teens and has participated in cooking competitions in the University. 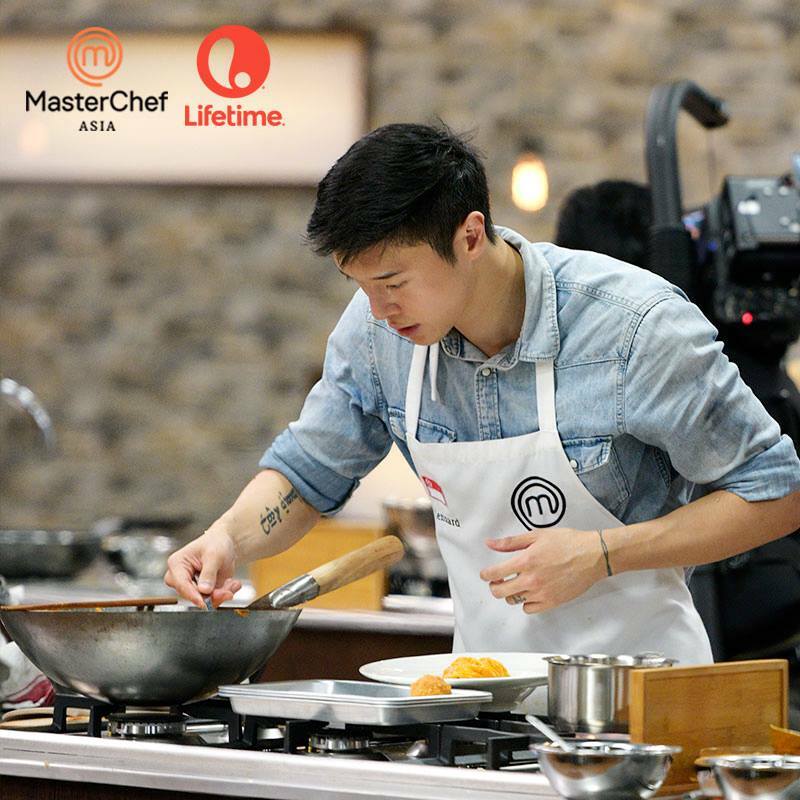 He hopes to find a fulfillment in a career as culinary professional and believes he has what it takes to be Asia's first MasterChef. I can sense a single lady swooning over Lennard and Leong who are both single (according to the judges) and an engineer and lawyer (respectively) at that. Haha! You better watch MasterChef Asia and see for yourself how good they are in the kitchen. Oh, my mommy readers will love Sandrian too! She is an epitome of a very good homemaker. 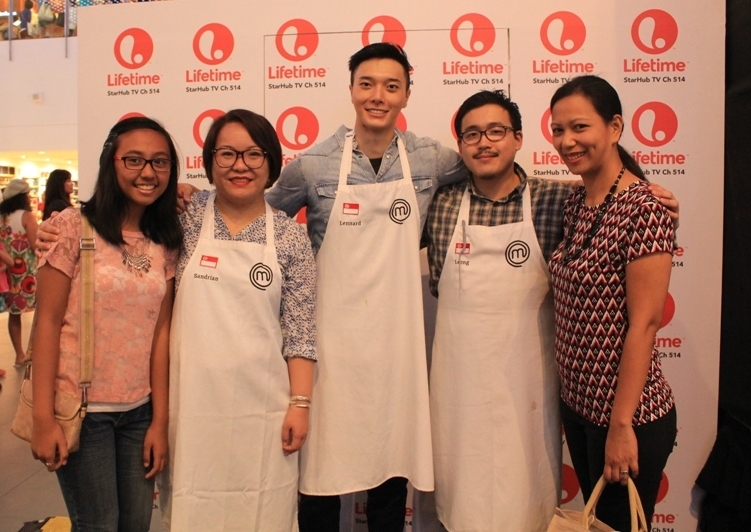 Sandrian, Lennard and Leong were given 30-minute cook-off during the event. K and I had so much fun watching them cook up a storm at the MasterChef Asia kitchen. 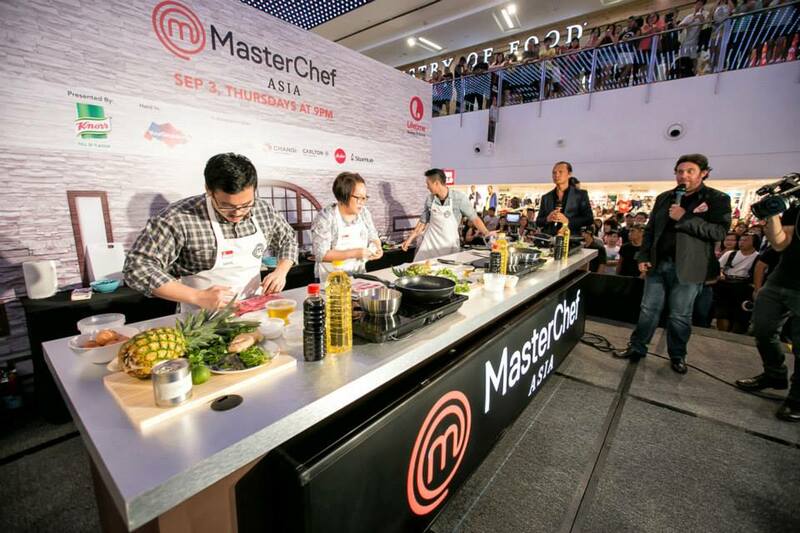 They wowed the audience with their inventive Mystery Box dishes at the final stop of MasterChef Asia tour. Eventually, Sandrian emerged as the winner in the said cook-off. 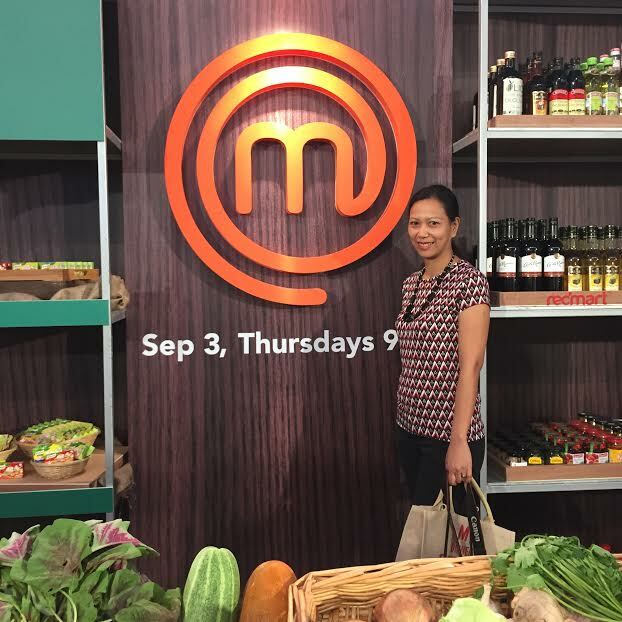 For me, the highlight of the event was meeting the MasterChef Asia judges in person, particularly Audra Morrice! I have always adored Audra in her Tasty Conversations at FYI (For Your Inspiration) channel. We were given a priority queue for the Meet and Greet and photo taking session. Oh what a treat! I got to shake Audra's hands and had a quick chit chat with her. She guessed that K and I were a mom and daughter duo but commented I could pass as K's sister. Teehee! Susur has been referred to as the “Father of Fusion” and has won numerous culinary awards including Food and Wine magazine’s “Ten Chefs of the Millenium” and the 5-Star Diamond award from the American Academy of Hospitality Sciences. He is the owner-chef of four highly-rated restaurants - LEE, Luckee, Bent and LEE Kitchen in Toronto, Canada as well as TungLok Heen in Singapore. 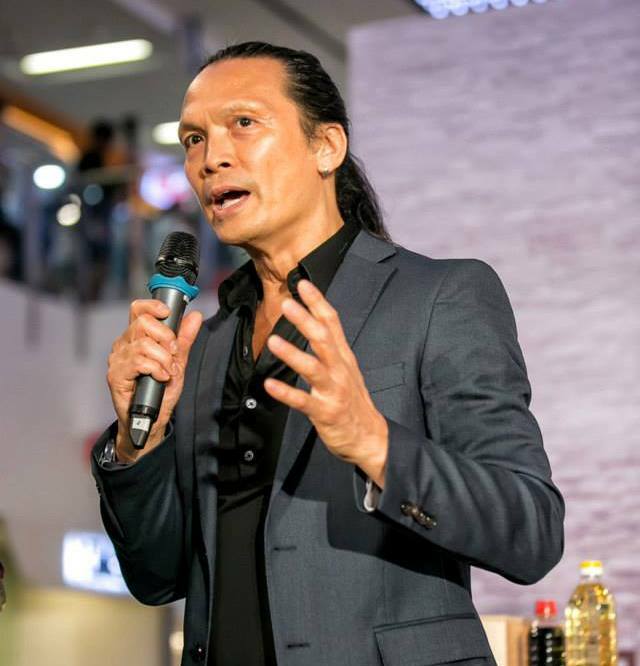 For 20 years, he has been the Executive Consulting Chef for the TungLok Group, which owns over 40 restaurants in Asia. Susur makes numerous television appearances and travels the world as guest chef and consultant. Following appearances on Iron Chef America, he became a media sensation on Top Chef Masters, where he vanquished 20 competing chefs and crossed filleting knives with his competitor in a kitchen showdown. Susur has also judged on Food Network Canada's Chopped Canada. Audra Morrice has been described as the next Martha Stewart of Asia. Her success on MasterChef Australia cemented her career in food and launched her into the world of culinary TV. Audra owns a successful catering business, hosts pop-up restaurant events and conducts South East Asian cooking classes. She will publish her highly anticipated cookbook and launch her own range of artisanal food products this year. Born in Singapore of Indian and Chinese descent, Audra is currently based in Australia. Working closely with the Singapore Tourism Board, she is an ambassador for the Singapore Celebrity Concierge campaign. Her televised cooking show, Tasty Conversations is also GEM in Australia and on FYI across Asia. Bruno earned 3 Michelin Stars at L’Osier, a Tokyo-based restaurant that has been voted one of the top French restaurants outside of France. 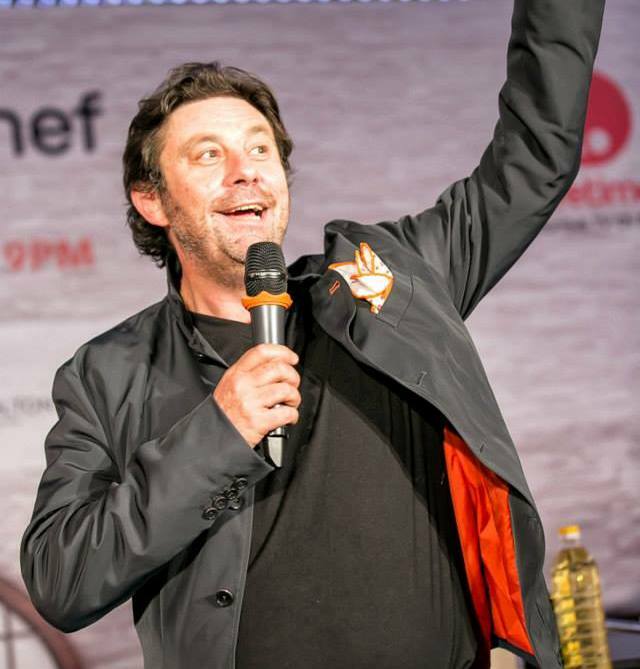 Bruno has spent 20 years establishing some of the best restaurants in Asia and currently runs a top-tier culinary consulting firm in Singapore. He was born in France to a chocolatier father and a patissier grandfather. He showed a strong interest in cooking at an early age, so his father suggested he take a summer job at a restaurant near his hometown of Tours at the age of eight. "The first dish I did was a recipe called croquette Pojarski," said Bruno. "At eight years old, I knew I wanted to become who I am today." MasterChef Asia premiers on 3 September at 9pm on Lifetime Starhub TV Ch 514. Don't forget to tune in! About MasterChef Asia: Lifetime brings together 15 aspiring home cooks from accross Asia in the first season of this pan-regional, English version of MasterChef Asia. Judged by HongKong born culinary genuis Susur Lee; 3-Michelin starred Chef Bruno Menard and Singapore-bron Audra Morrice, a MasterChef Australia finalist. 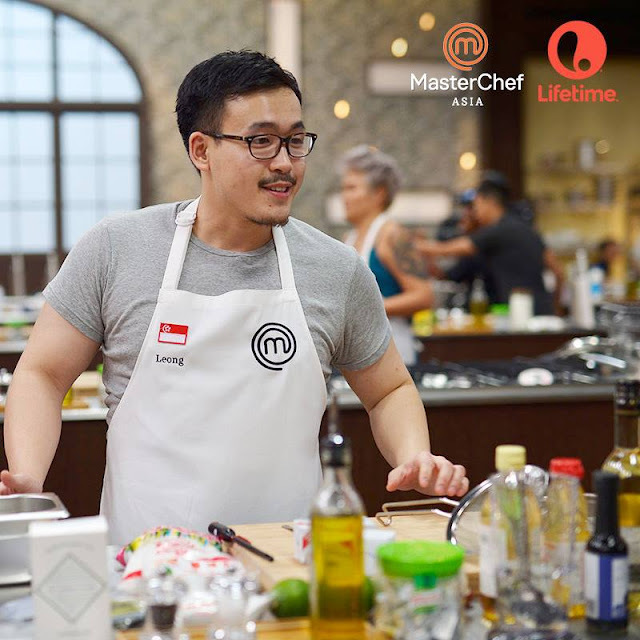 From the MasterChef kitchen to off-site and overseas challenges, the 15 episodes will culminatein one home-cook winning the title of the first ever MasterChef Asia winner. MasterChef Asia is presented by Singapore Tourism Board and Knorr, in association with Panasonic, Changi Airport Group, Carlton Hotel Singapore and Air Asia. My oh my, I would love to watch a real chef cook in front of me. Great pictures sis! Looks like a super fun event! I love watching Masterchef. Awww! How very lucky you are Sis to meet those famous chef. I bet one of them is your favorite.